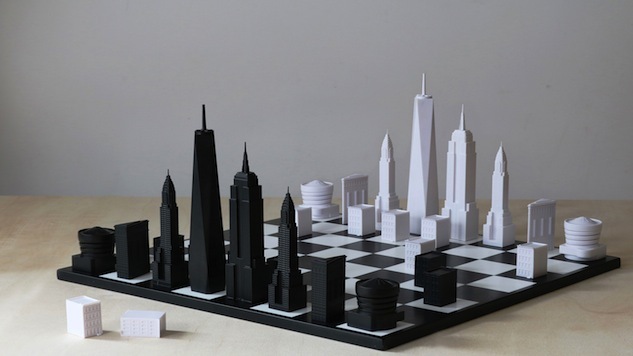 Founded by two London based architects, Chris and Ian, Skyline Chess is a company that takes iconic architecture from all over the world and recreates it as chessboard pieces and it’s pretty freaking cool. The two launched the project with their home of London, of course, and with its success have announced that they are currently working on a New York City skyline edition. The concept for the project came from late nights the two spent playing chess while living together back in London and essentially wanting to create a way to allow you to play as your favorite cities and having them duel it out against each other. Within the NYC edition, One World Trade Center is King and the Empire State Building is Queen—which, in the realm of the NYC skyline, is pretty accurate. Having visited this city many times, it’s inspirational and iconic high-rise architecture made it the perfect choice for us to bring to the chessboard. We’ve chosen a range of buildings from across the city, some of which capture the essence of the early 1900’s construction boom and the growth of skyscraper architecture, through to their more contemporary counterparts, along with some of the city’s most recognisable silhouettes. We gave careful consideration to selecting each piece on the board, to ensure that it both visually reflected the appropriate chess piece and also reflected the architectural status and scale of that building in the city.